Utah Onions, Inc. started its journey in the early 1940s. Back then, a small group of Utah farmers were in need of help selling their fresh produce to communities and grocers. A man named Charles H. Dredge, and his company, aptly named CH Dredge, took on the responsibilities of packaging and selling onions and various other produce for the group of local Utah growers. In 1977, Dredge sold the business to four Utah Farmers and a group of investors from Texas. From that time forward, the company was known as Utah Onions. The farming investor group was able to grow the company into more than a packaging and selling outfit. Utah Onions became known as a grower, shipper and packager of quality crops. The company also took on more packing and shipping responsibilities as time carried on, bringing in trade partners. Hartley’s Best and Oregon Trail Produce. in the late 1980s. In August of 2005, a small group of three, each with their own roots in the onion and produce world, Shawn Hartley, Trent Hartley and Brad Dahl, purchased Utah Onions from the investment group. They continued to build the company, expanding with additional growers and farmers. 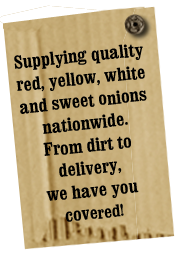 Today Utah Onions is one of the nation’s leading grower-shippers of quality yellow, red, white, sweet and organic onions. The company has growing locations in Utah, Idaho, Oregon, and Washington State. These diverse locations allow Utah Onions to meet the on-going needs of any customer, in an efficient and timely manner. Utah Onions is extremely excited for the future of Onions. The company is continually looking towards new ways to improve its processes, expand its offerings to customers, and build lasting relationships with new trade-partners. Utah Onions is the future of the onion business.